I don't know if this is technically considered a recipe, since it requires minimal preparation. All I know that it is DAMN good, and takes less than 10 minutes. Best of all, it is composed with all healthy, REAL ingredients! I don't need to tell you how many benefits avocados can provide, and while they are terrific on their own, this just amps it up to a new level. - Preheat oven to 450°F. - Begin your preparation by combining the bread crumbs, parmesan cheese, basil, lemon juice, minced garlic, salt and pepper in a small bowl. - Set that bowl to the side, then cut the avocado in half, and remove the pit. Distribute the salsa between the two avocado halves. Proceed to top that with the bread crumb mixture. 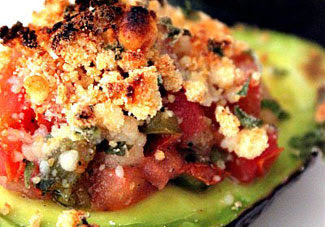 - Place the avocado halves on a small baking sheet, and bake for 5 minutes.